With the recent conflict to depose the old Iraqi regime of the last 24 years, we’ve put together this special edition that details the most common small arms utilized by the Iraqi, British, and U.S. forces involved in the conflict. This includes the main assault rifles used by each force, and heavy weapons like machine guns, mortars, MANPADS like the Stinger, and man-portable anti-tank weapons like the Javelin or RPG-7. With this revision, not only did the 60 weapons of the previous edition get expanded with new data for our new licenses, but we have also expanded the weapon listings to over 125 small arms, plus a primer on biological and chemical weapons. 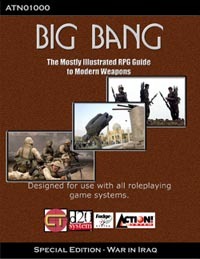 This product is designed as an expansion to Big Bang: The Mostly Illustrated RPG Guide to Firearms Volume 1. Therefore, that product is required in order to make full use of this one. As always, a great value for gamers, historians, and weapons afficionadoes as well. NOTE: This volume contains all new material not found in the other volumes. It is not a republishing of the first volume.